Although it appears harmless this wild parsnip, combined with sunlight, can cause tremendous skin damage to its unsuspecting victims. Wild parsnip (Pastinaca sativa) grows wild – often in road ditches and abandoned areas – and is a member of the carrot family, closely related to the cultivated parsnips you might grow in your garden. It is easily spotted in June and July when it has 3 to 4 foot tall yellow flowers arranged in umbrella-shaped clusters characteristic of all members of the Umbelliferae carrot family. Wild parsnip is a biennial, usually appearing as a spindly rosette of leaves in the first growing season, and producing flowers in the second. The basal leaves are long and frilly with saw-toothed edges. The most interesting thing about wild parsnip is its propensity to cause something called phytophotodermatitis. Translated, phytophotodermatitis is a plant-related skin irritation induced by exposure to light. If the juices from wild parsnip come in contact with your skin in sunny conditions, you will experience severe skin damage. The skin damage occurs thanks to the furocoumarin chemicals in the plant tissue. These chemicals, while normally quite harmless, are energized by ultraviolet light (like that found in sunlight). If first absorbed by your skin, the energized furocoumarin molecules destroy your skin tissue by binding to the DNA and cell membranes resulting in severe burns, blisters, and patches of dead and discolored skin. Unlike with poison ivy, no one is immune to the effects of wild parsnip. While a poison ivy induced skin irritation is caused by the body’s own immune response, the damage from wild parsnip is caused by a chemical reaction that is very much like an accelerated sunburn. If exposed, the redness shows up in 1 to 2 days as streaks and blotches where the cut stems dragged across the skin. The redness and burning is usually followed by a blackening of the skin and blisters which can be quite severe. Badly burned skin can be discolored for months, years, and even permanently. Many people who develop the reaction (and even the medical professionals who treat them) are often baffled by its cause and falsely attribute it to poison ivy. 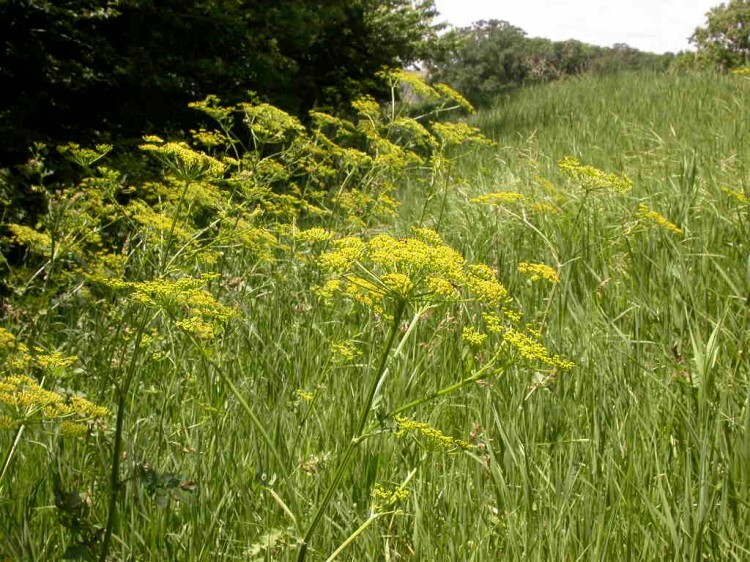 Even most trained dermatologists are unaware of wild parsnip or its effects on the skin. Wild parsnip is an exotic plant species native to Europe and Asia. It can be invasive and spread aggressively. It is easily controlled, however, by cutting the root just below the ground with a spade. If hand-pulling is necessary, it is important that gloves be worn or the work be done in early morning or late evening hours when little light is present.